Relatively few tourists venture to northeastern Thailand, the region known as Isaan that is the country’s rice bowl. That’s a shame, because provinces in Isaan have plenty to see, the region’s cuisine is one of Thailand’s most exciting (it’s the home of somtum papaya salad, after all! ), and the overriding lack of tourists means you’re likely to experience something closer to ‘authentic’ Thailand. Here’s where to go on your trip to Thailand’s northeastern Isaan region. Upper Isaan’s Udon Thani is easily reached from Bangkok either with a short budget flight or by train, Udon Thani is home to a significant number of both western expats and Thais of Chinese and Vietnamese ancestry, and it’s a lively city with plenty going for it. There are markets and parks to explore, with plenty of typically delicious Isaan-style Thai food to chow down on – think infinite somtum papaya salads and much more. 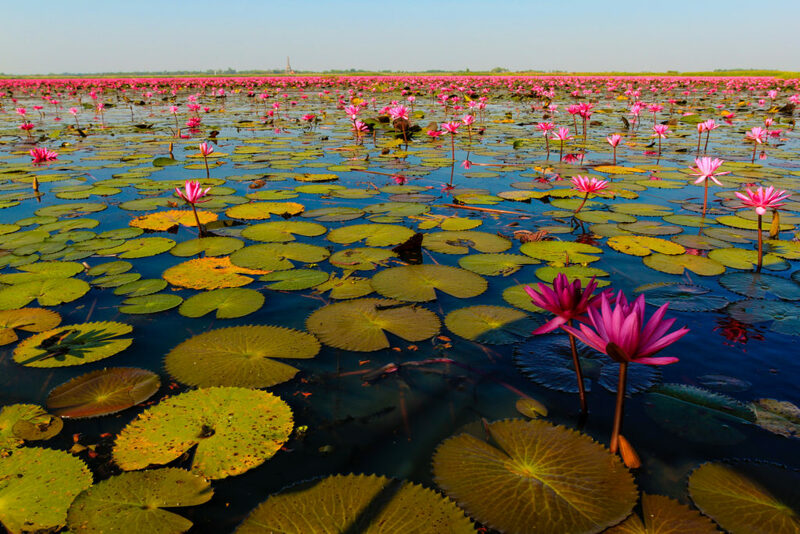 Udon Thani is also home to the increasingly popular attraction of Talay Bua Daeng, or the Red Lotus Sea, a lake covered in pink-crimson water lilies that spectacularly carpet the water’s surface when they bloom, making for a romantic boat ride. Comparatively small Nong Khai province is popular with those making a trip to Laos – whether for a visa run or simply for pleasure – since it’s quick, inexpensive and easy to take a budget flight to Udon Thani, a bus or van the rest of the way to Nong Khai province’s Thailand-Laos border, and then onwards just another 20km or so to Vientiane. But Nong Khai still holds plenty for those who choose to stick around here, and its relaxed setting alongside the Mekong River is enough to hold many travellers in its grip for a little longer than they planned. And once a year, the supernatural-seeming Naga Fireballs Festival sees crowds gather to watch infamous balls of light float magically over the river’s surface, believed by many to be evidence of mythical serpents deep in the water. Straddling Isaan’s Nakhon Ratchasima (Korat), Saraburi, Prachinburi and Nakhon Nayok provinces, Khao Yai National Park is Thailand’s third largest, and is a huge draw for both domestic and foreign travellers who likely wouldn’t otherwise give much thought to travelling to the northeast – and indeed, for the most part, probably don’t even realise they are in Isaan at all. The park is a comfortable drive from Bangkok, and the truly impressive abundance of wildlife – plus plenty of waterfalls and other attractions – is the reason Khao Yai continues to draw in both holidaymakers from overseas and weekending Bangkokians en masse. 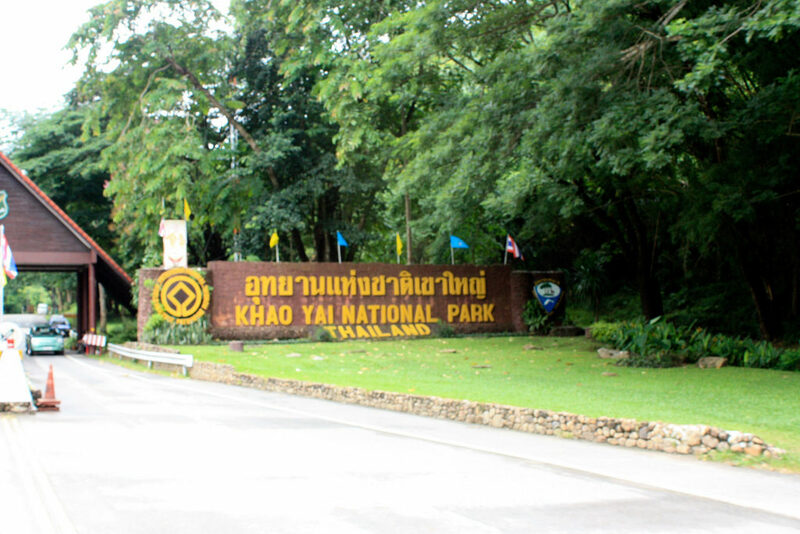 Note that, in one of the more extreme examples of Thailand’s polarising dual-pricing policy, foreigners (whether tourists or tax-paying residents) are charged a 400-baht admission fee to Khao Yai National Park – 10 times as much as Thai nationals, who get in for 40 baht. Outside the park’s boundaries, there’s a growing number of guest houses, hotels and resorts ranging from inexpensive to high-end luxury, many taking advantage of the area’s bountiful views. It’s Yasothon’s insane annual rocket festival that puts it on the map, bringing to life an otherwise quiet and fairly unremarkable province. Huge, largely homemade, and often incredibly powerful rockets are assembled and fired into the sky as part of a festival that – in much the same school of thought as Songkran around this time, and Loy Krathong at the other end of the rainy season – is believed to lay the foundations for the spiritual powers that be to bless the region with plentiful rain for the upcoming agricultural season. Unfortunately but perhaps predictably, safety isn’t always what it could be, and there are occasionally reports of injuries and even deaths from rocket launches going wrong. Khon Kaen’s bustling, fairly modern capital is evidence of how this province was one of the big winners from the region’s economic boom. Though it’s not much of a tourist-geared city, it’s considered the gateway to Isaan proper, and it’s also home to a number of visit-worthy temples, the attractive Bueng Kaen Nakhon lake, and photogenic fresh markets packed with plenty of Isaan-influenced typical market fare to munch on. One for nature lovers and those who enjoy travel with a rural flavour, Loei province is known among visitors for three major attractions: the annual Phi Ta Khon ghost festival, the increasingly popular Phu Kradueng National Park, and riverside Chiang Khan. The mountains of Phu Kradueng National Park get positively freezing in the depths of the cool season, often earning the province the title of Thailand’s coldest, while Chiang Khan town has a relaxed, romantic riverside vibe and a popular walking street area. Phi Ta Khon, meanwhile, sees a parade of locals donning positively hideous-looking ghost masks that are meant to represent animist-belief spirits. The costumes form part of a ceremony to awaken, welcome and seek the protection of a local spirit. A large-scale celebration then recreates the mythical return of a prince – a previous incarnation of the Buddha in one of his past lives – who had been wrongly assumed dead after embarking on a long journey. Finally, with echoes of the rocket festival traditions of Yasothon and the wider region, costumed locals seek the blessing of the prince, and the other gods and spirits, to bring an abundance of rainfall. Along Thailand’s border with north-western Cambodia, Angkor-era Surin is best known for its elephant population, and for its annual elephant round-up. These round-ups have their roots in medieval royal hunts, which were later transformed into public performances, and in turn served to provide income for mahouts who suffered as the commercial value of elephants fell. These days, Surin’s elephants are used to put on a variety of performances ranging from polo to painting and tug-of-war. Many will feel uncomfortable with elephants being used for this kind of entertainment, and elephants are also sadly still paraded around town for tourists to buy them food – something previously seen on the streets of Bangkok, but which has thankfully now largely disappeared. With that in mind, we encourage you to read our thoughts on animal-centred tourist attractions. Elephants aside, Surin also has a good number of Khmer ruins worth exploring, plus the usual mix of markets and foodie delights. Where have you been in Isaan? Which is your favourite province or festival? Let us know in the comments!